The Larson Electronics EPF-E16-4450-460V.3P-10C-3P4W Explosion Proof Box Fan/Blower with 15 feet of static conductive duct safely and effectively redirects stale air from hazardous location areas. This explosion proof blower meets UL and ATEX standards for hazardous locations and provides high 4450+ CFM output for effective airflow in larger spaces. The unit comes with 10 feet of 16/4 SOOW cord that is terminated in an explosion proof pin/sleeve cord cap. This portable, electric explosion proof blower (exhaust fan) is suitable for confined spaces and is approved to UL and ATEX safety standards for hazardous locations. This fan features a high efficiency multitap 1.5 hp motor which is fully encapsulated and a precision balanced, non sparking aluminum blower blade for high output and protection against accidental ignitions. 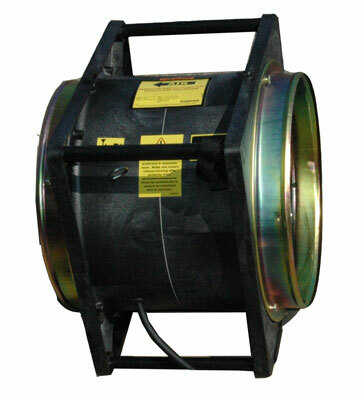 This fan has 16 inch intake and exhaust flanges and produces over 4,450 CFM of air output for excellent movement of air in large areas. Other features include a light weight/high strength, anti-static glass reinforced ABS housing that is corrosion proof and chemical resistant with an IP65 rated and rain tested switch enclosure. This box blower/fan operates on 460V AC three phase with an 18 amp initial draw and 5 amp constant draw after startup. The included 15 foot long duct is a single-ply polyester reinforced PVC vinyl fabric hose design with an external wear strip reinforced with a spring steel wire helix. It is lightweight for blower applications and highly compressible. The retractability of the static conductive duct allows for convenient storage and easy transport in a fraction of its fully extended length and has low friction loss. The wear strip offers external abrasion resistance, and is listed as YL 94 V-0 flame retardant. Ambient operating temperature fro this unit ranges from -20 degrees to 180 degrees Fahrenheit. Wiring: The EPF-E16-4450-460V.3P-10C-3P4W comes with 10` of 16/4 SOOW cord that is terminated in an explosion proof 3-pole, 4-wire pin/sleeve cord cap.